Sichuan pepper production at home? Look at this beauty! It’s a tiny Sichuan pepper tree! It was a present from Richard S., a friend of the Oxford Food Symposium’s, who managed to track one down in a specialist nursery in the UK. He told me he’d give me one a long time ago, and here it is! The leaves have some of that bewitching pepper fragrance if you squeeze them between your fingers. I have no idea how long it will take to bear fruit, but I hope it will eventually – I have seen one fruitful Sichuan pepper tree growing in Oxford, so I know it’s possible in the English climate! At the moment it’s sitting in a pot on my sunny, south-facing windowsill, but I hope to transplant it to my parents’ garden in Oxford before too long, where it will have more room to grow. As those of you who have read my ‘Shark’s Fin and Sichuan Pepper’ may know, I have never quite got over abandoning a tiny Sichuan pepper tree from Hanyuan at Beijing airport a few years ago. I had transported it very tenderly all the way from the mountains of Hanyuan to Beijing, but Britain was in the midst of the foot and mouth epidemic, with widespread paranoia and tight restrictions on agricultural imports, and I chickened out at the last moment and left it behind. Which nursery? I assume it’s not Battersea Homebase. I attended a demo by a Sichuanese chef in Dublin (he made awesome dandan mian for us at the Chester Beatty library). He said that there are prickly ash trees in St Stephen’s Green in Dublin city centre but that when he tried, he could not get any anything useful from their fruit. A nursery here in Oregon that sells the plant says that it’s dioecious–in other words, each individual bears only male or female flowers, and you need both sexes to produce the peppercorns. Gosh Tom, does that mean I’ll have to arrange hot dates for my plant when it’s a little more mature? I could put an ad in a lonely hearts column… Perhaps there are other Sichuan pepper trees in the same predicament, stranded a long way from the hills of Hanyuan, desperately seeking compatible foliage for an urgent, intense exchange of pollen? Fuchsia–it’s entirely possible! There’s nothing sadder than a lonely Sichuan pepper tree! I am trying to grow from seed, but I think they need stratification (a good frost or some time in the fridge) before they’ll comply. For plants, search for Zanthoxylum schinifolium. There are nurseries in the UK that grow and supply it, but many are out of stock. I blame Fuchsia. I tasted fresh Sichuan peppercorns at a botanical garden in Limoux, France last year and they were intense – the citrus-like flavour was more pronounced and the numbing was medical grade anaesthesia. You can buy green Sichuan peppercorn oil, labelled as Rattan Chilli Oil – a 50:50 blend of rapeseed oil and fresh Sichuan peppercorns – at some Chinese supermarkets in the UK now. It’s potent stuff. Mark mentions them in the latest food programme, he has like a forest of them it seems. You’ll need at least three I think. He sells them btw http://www.otterfarmshop.co.uk/ I tried to grow them from seed, one came up but died. Seeds need cold stratification (pop them in the freezer…) Did manage to grow Jujubes from seed. As with normal hot peppers you can also use the leaves in recipes so even without seeds they are still usefull. I have a Sichuan peppercorn tree in my yard here in the SF Bay Area, and it grows fast and bears the peppercorns like a trouper. It was given to me by a fellow mala lover who grows his from the seeds, and it definitely is self-pollinating. Besides, if you grow these thorny guys yourself, you also get to enjoy the tender leaves in spring. (I wrote about this on my blog: http://carolynjphillips.blogspot.com/search/label/Sichuan%20peppercorns.) Hope this helps… and good luck! Does anyone know of US sources for seed or plants? Anyway, good luck fushia with your little tree, keep it green ! I have been trying to buy a plant from Mark Diacono since March. Despite them being on his shop website he says he does not have any at present. Well, just to add to the confusion, two weeks ago, I bought the Szechuan pepper plant froma reputabl nursery. I bought a nice one with the peppers on it so that would be a female. But, they weren’t able to tell me which were the male plant as they didn’t have a lot remaining and I didn’t want to take my chances. Just this morning, I went to my favourite vendor at the Farmer’s Market in Lake Oswego, and this is what he told me. He says the plant actually has both male and female in it. If we get only one that has the berries already, it will self-pollinate again, but takes like two years before you see any fruits. If you have more than one, preferably three, the chances of getting pollinated increases and thus, you will get berries faster and more. So, hopefully, he is right and I shall let everyone know two years from now. Chris. Possibly not. When I was reading up on them I learned that the seeds don’t stay viable very long. I got some from a seed company here in Canada, and two of them sprouted just fine. I’ll try to dig up the name. This isn’t the greenhouse I got my seed from, but it is the same stuff – simulans though, not piperitum. Seed needs to be sown fresh in the autumn and allowed to experience a number of freezing episodes over the winter. Protect from voles. Z. simulans (syn. schnifolium) are self-fertile in my experience. Z. piperitum is dioecious. We have plants for sale. I have been around this ingredient all my life and just started to research this plant. My mom said it grows wild in Iowa. Might have to make a trip up there to confirm. I am here in Beijing, I see these pepper plants in the back garden also, but cant find anywhere selling them, love to get some small ones before I leave. could any one tell me where I can get a small plantor two. 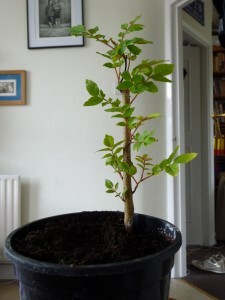 I bought a plant last year from agroforestry.co.uk, it came happily through the winter in North/Central London and has fabulous smelling leaves but no flowers this year. I’m hoping it’s just not old enough yet. Just ordered seeds from horizonherbs.com in Oregon. Supposed to be Simulans. Re wild plants in northern US, the Northern Prickly Ask is similar, aka the toothache tree, but flavor intensity is near Zero compared with the real thing. National Zoo in DC had one growing I used to pick the berries from until they cut it down. I could have fed whoever did that to the Tigers! Trunk was near 18 inches across and they are an endangered species in Maryland, though abundant farther north, often used as hedges and viewed as a weed tree. At last I have seeds of the Simulans on it’s way. They are supposed to be growing a similar variety in Fresno California as part of the Hmong transplanted culture after the Vietnam War. Nearly got on a plane to find them. What I’ really like is a clone of Fuscia, at least living next door to invite my family including our Sichuan daughter over for meals and a chance to practice our Chinese language and cooking. Seeds arrived in January. Cold treated them per instructions in damp paper towel in fridge for three months. Planted them in little peat pots a week ago and one has already sprouted! Was supposed to take at least another month. As luck would have it, I just found a US nursery that had 2-3 foot seedlings in gallon pots . http://www.raintreenursery.com/Sichuan_Pepper_Gal_Pot.html. Ordered three. First nursery in the US I found that had them and I’ve been looking for years. (Since 2002 ) Last shipment going out Friday (May 16) for this year. There is hope for us in the US! Here in East Anglia my Sichuan pepper is growing beautifully, but I have a nasty feeling it’s a boy! Is there anyone in the Far East of England who could supply a female plant please? This UK nursery sold me a tree a couple of years back. http://www.edulis.co.uk/ It has grown well and survived a couple of winters in Oxfordshire. This year I have about 60-80 peppercorns on the tree. They are not quite ripe yet (July 20), but full of flavour and I can echo what people say above – fresh peppercorns are even nicer – citrusy and aromatic. Maybe you don’t need a male/female pair of trees – it seems unlikely that there is a second tree locally. A cutting from the tree may have worked, and I’ll try a few more over winter. Also I’ll have a go with a few seeds and stick some of them in the fridge in moist sand to see if that is needed. The nursery had an excellent specimen which looked about 10 years old, grown as a standard tree 10-12 feet high, 4-5 inch diameter. This arrangement allows all the ferocious spines to be chopped off below head height, and you could also lay a plastic sheet on the ground and knock the seeds onto it. Apparently this tree has cropped regularly. After mid-August to late to fully mature by the end of September gathering wild pepper seeds, postharvest back booth in dry, ventilated room, let it dry, peel off the rip seeds, the seeds were placed in 30% of alkaline water soak for 24 hours and hand repeatedly scrub, remove grease, then rinse with water, then with 2% potassium permanganate dressing disinfection. Mid-November, choose loose soil, fertilizer, tidal land for seedbed planting, enough farmyard manure before planting, made 1 meter wide, 30 cm high furrow, ditching drill, four rows of each plot. After sowing the fine sieve with a 2 cm thick layer of farmyard manure cover species, and Mulching moisturizer. When spring emergence, timely lifting the cover when seedlings up to 10 cm by 10 cm spacing Dingmiao, about 20,000 per acre, later combined with weeding, fertilizing, Maya, prompting shoots robust growth. I’m a confirmed Ma/la addict. In New Zealand we have a lot of good Asian food markets where I can source Sichuan chilli and pepper, but the pepper is never that good (I suspect it has been stored in warehouses for quite some time before going on sale), so I’ve grabbed the tiger by the tail and ordred a prickly ash plant (Zanthoxylum schinifolium) from our local garden spot. I cant wait to crank out some of your recipes using freshly harvested peppers! BTW do you have a sichuan pepper oil recipe? Your Hong You recipe is a firm favourite at our place! I am an American currently traveling through Sichuan and stopped in Hanyuan for some truly “ma” hotpot. Ladies were picking fresh sichuan peppercorns right outside the hotpot restaurant. For the heck of it I popped one of the red berries in my mouth. WOW! The fresh ones were way more potent than what I get in the States or even Chengdu. My thoughts instantly came to growing my own back home. I would probably chicken out at customs too, but I’ve got to figure out a way! Thanks Fuchsia for bringing authentic Sichuan recipes to me via Land of Plenty, and giving me hope that I can one day grow fresh sichuan peppercorns in New Jersey. Sounds wonderful, wish I was there too!